Whether it’s fixing up European classics at his local full-service auto shop or rescuing a sinking business, Thurmont business owner and Discovery Channel star Chris Stephens is making an impact. The Discovery Channel’s Garage Rehab, featuring Stephens and his two co-hosts, Russell Holmes and Richard Rawlings, tackle a struggling business each week in a race against the clock to set up auto shop owners around the country with a business plan for success. The hit show has just entered its second season, where Stephens and company are continuing to pour blood, sweat, and tears into building a life-changing garage for shops in desperate need of a business intervention. Fortunately for Stephens, the difficulties of the expedited rehabbing of a struggling body shop has gotten easier throughout the development of season one, heading into season two. Outfitting a shop with the correct equipment, tools, and training is a near impossible task to accomplish in a week’s time. But, implementing a business plan to bring the necessary changes for these families and companies to turn their futures around seems like a truly impossible feat. Yet week after week, the Garage Rehab team hits the road and designs a game plan for success that is personally tailored for each location and demographic to build a better future. Spending time in the area, talking with locals, and doing market research gives the group an idea of what will work and what won’t, and Stephens takes that information and builds a foundation for the new garages. Sometimes, the changes aren’t easy, but in the end, the rewards are felt by the families, friends, and communities built around these auto shops. The show features Stephens and the crew fixing the issues plaguing the business, making changes to put them in a position to make money, and, eventually, revealing the brand new shops to owners with a touch of dramatic flair. The reveal is often an emotional passing of the torch, from the old, struggling business to the new and improved shop. But the team’s work is not done there. The training then begins, showing the garage owners how to use their new tools and resources to put them in a position to succeed for the future. Over the course of the two seasons so far, Stephens has been a part of a wide variety of garages, all with different stories to tell. “We’ve done regular mom and pop body shops, and then we’ve done a lot of hot rod shops. We also did a motorcycle shop,” said Stephens. When Stephens isn’t out touring the states with the Discovery Channel, you can find him turning wrenches on European classics at his auto shop off Putman Road. 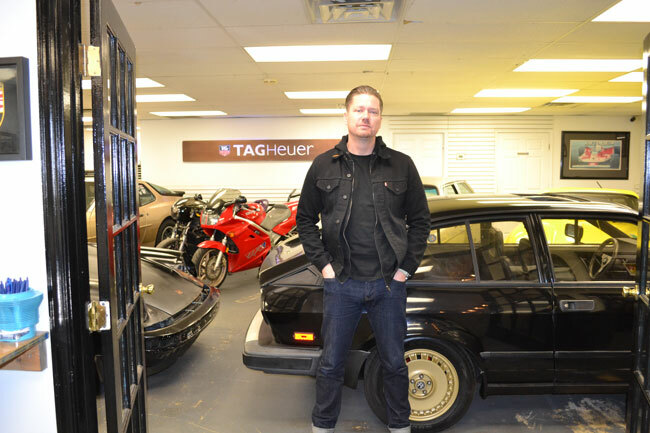 His brother, Marc, runs the day-to-day operations of their shop Eurotech Classics, which services all European cars, from vintage European roadsters to modern day Volkswagens. If you would like to catch new episodes of Garage Rehab, the show premiers Tuesdays at 9:00 p.m. on the Discovery Channel, or you can find previous episodes online. Eurotech Classics business owner and star of Discovery Channel’s Garage Rehab, Chris Stephens.